Bay Winchester is having a tough week. 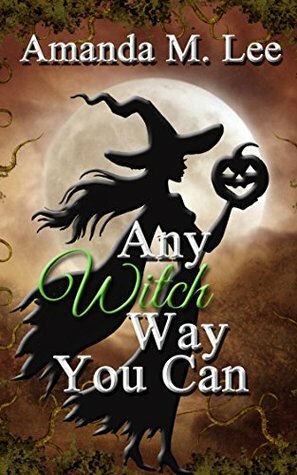 This wouldn't be a problem for a normal reporter, but since Bay is descended from a well-known line of actual witches, the town is understandably on edge. Between the suspicious townspeople, the befuddled police presence and that random hot biker guy that may or may not have something to do with the murder -- Bay has her hands full. When you add the typical family problems, multiplying ghosts -- and one monster of a zit that she's sure came from her aunt's curse -- Bay is just struggling to make it through the week. So I really like this series and I decided to read it for an actual review on the blog. As I said before, I really like Cozy Mysteries, I also really like paranormal cozy mysteries. So, Bay and her family are witches, they live in a town that knows they are witches and despite the town being re-branded as a "witch town" they are distrustful of Bay and her family. Then a murder happens which leaves a teenage boy with his heart cut out. Bay discovers the body and since Bay can see ghosts and discovers the ghost of the boy at the murder scene she is of course entangled in the web of the murder. I have a thing for ghost seers in books (not T.V shows though, weird). I really like the inclusion in it in this series, I feel like it really fits in with Bay's character and family. Also, is there this unspoken rule that witch families have to be like extremely close? Because Bay and her family are really close (and in a lot of cozy mysteries I read it's always like that) and while I don't mind it, the CONSTANT back and forth banter with her cousins (Thistle and Clove, why always weird names?) do, at times, get very annoying. It gets to the point that it distracts from the story and I just end up rolling my eyes and skipping ahead. That is really the only thing I don't like about the book. While the murderers are a bit obvious the story was fun and easy to read. The romance did not get in the way and while yes, there was an instant attraction, it didn't annoy me and take precedence over the story and character development. Lee did a great job at creating her characters and the town of Hemlock Cove, and I look forward to reading the next book for review! Amanda M. Lee currently writes 4 popular series. She is a fan of Comics, and Starwars and while she was thinking of being a jedi knight or super hero she eventually settled on writer. She is a long time newspaper reporter and loves reading science fiction.